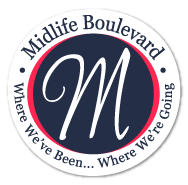 Piddle around getting other things done rather than doing what we NEED to get down. For me, it's not always that I don't want to DO what I need to get done, I would just rather do other things. 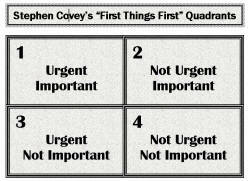 Years ago, I learned Stephen Covey's method of using a quadrant to help move people along when blocked by an overwhelming To-Do list or life in general. It helps to prioritize things quite easily. There are four blocks in the quadrant. You can make four lists or list the appropriate "Q" beside each item on your list. This isn't new stuff, folks. You've seen similar ways to prioritize. But the success comes in actually DOING IT. You don't necessarily have to do this everyday, maybe as you're planning your week or weekend. Maybe as you're checking emails. So, stop right now and start prioritizing. You'll be surprised how many things aren't really as urgent and important as you've made them to be. I've got to go now. I have more urgent and important things to do!